These are old homes that the family has built and lived in over the years. Some of those designated historic are linked to websites set up by foundations, civic groups, etc. This was the home of Horace L. Parmelee [1819-1898; Moses, Asahel, Lemuel, Nathaniel, Nathaniel, John, John] and wife Eunice [1822-1905; Rufus, Cornelius, Josiah, Nathaniel, Nathaniel, John, John]; Horace and Eunice were third cousins. After her husbands death, Eunice sold the farm to William Kathotka of New York in 1904, who then sold it to the Pavelka family in 1906. From 1948 to 1956, the property was owned by Edward and Martha McGrath, who ran it as the Farm in the Dell summer resort. It was then owned by the Bosco family and was known as Boscos Turkey Farm. The farm was purchased by the town of Killingworth in 2000 and it is operated as community open space, including trails and the Killingworth Community Gardens. 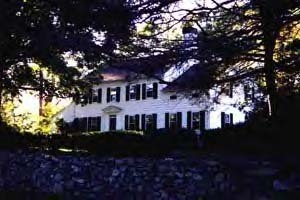 This home was built by John Parmelee [1755-1828; Jeremiah, Lemuel, Nathaniel, Nathaniel, John, John] on the eve of the Revolution on property his father gave him in present-day Chester [then Saybrook] along the Killingworth town line. John, who served as a drummer in the war, moved to Vermont, where his father had relocated, and later took his family to Connecticut's Western Reserve, where he lived out the rest of his life on a farm near Sullivan, Ohio. 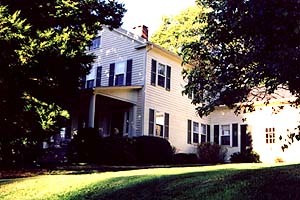 His old house was incorporated into what became The Inn at Chester. It's now a conference center and home to a family baptism bowl. Click here to see a sign from the inn. 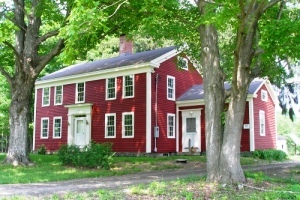 This home was built by Jedidiah Parmelee [1702-1786; Stephen, John, John] and is one of the oldest in Newtown. It's around the corner from his brother Noah's, below. This house, on 24 Points o' Rocks Road, belonged to Noah Parmelee [1699/1700-1770; Stephen, John, John] and is around the corner from his brother Jedidiah's, above. The left side was built first, with two bake ovens by the fireplace. A kitchen fire did significant damage to this home in January, 2006. 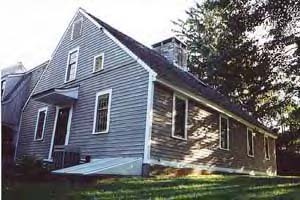 The house, at 293 Route 148, has been recognized by the Killingworth Historical Society. The home was built by Samuel [1743-1808; Ezra, Nathaniel, Nathaniel, John, John]. Investigators determined that the fire started when a pot was left on the stove. Samuel's name can be found in Revolutionary War records. Henry Barnard Hall, on the Yale campus, was built as a home for Charles H. Farnam. In 1896, Henry Spencer Parmelee [1844-1902; Spencer "Thomas," Henry, Samuel, Joseph, Isaac, John, John], the man who patented the fire sprinkler, bought the house from Henry R. English. Son Henry Francis (1875-1918) also lived there. President William Howard Taft and wife Helen were interested in 23 Hillhouse Ave. when they left the White House. Houses, Part I: Family homes in Guilford, Conn.